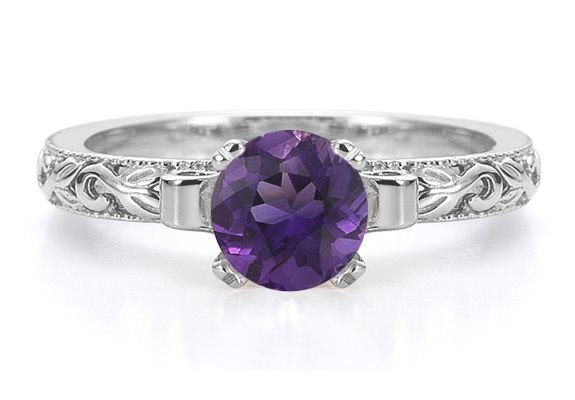 Give your passion for purple a new twist with this art deco ring from Apples of Gold. An exquisite amethyst gemstone is the perfect centerpiece for this ring with its winsome purple color. The gem sits in a decorative but functional white gold setting that raises the stone above the ring to better capture light. The band is also forged of white gold and features art deco style scrollwork with bold shapes that are sure to reinvigorate any jewelry collection. Also available in 1/2 Carat Size. We guarantee our 1 Carat Art Deco Amethyst Engagement Ring, 14K White Gold to be high quality, authentic jewelry, as described above.